President Bush and the White House are involved in intense negotiations over the final shape of a bill that Bush will not follow once it becomes law. "It is very important to the President that he and the Senate agree on the precise contents of the law he will not be obeying," said White House spokesman Tony Snow, explaining the President's particular interest in the negotations. "There must be a real spirit of give and take, of true compromise, in fashioning what will soon be completely irrelevant to the White House," agreed Senators John McCain, Lindsay Graham, and John Warner, the principal lawmakers demanding completely cosmetic and ultimately meaningless concessions from the faux-conciliatory Executive Branch. President Bush and the White House had been adamant that the Senate pass a law that allows for an "expanded view" of what kind of interrogations are permissible under the Geneva Conventions, but, in the face of opposition from McCain and others, are now signalling that they may give up some of their specific demands just to get the law through Congress. After that, the President will issue a "signing statement" reiterating his belief that laws are not binding upon him. Some Senators insisted that the negotiations were important to maintain America's moral authority and credibility on human rights internationally. "At all costs, we must at least maintain the appearance that we have a real working system of checks and balances," said a senator who wished to remain anonymous because his statements are usually entirely absurd. Cletis Fishkill, an inmate doing twenty to life in a prison in Fishkill, New York, expressed his admiration for President Bush. "Damn," he said. "I gotta get me some of them signing statements." Buy This Book. Save America. Most Americans absolutely support liberal values and would like to see them advanced. How then is it that Democrats don't strongly rebut Republican rhetoric and trumpet -- and practice -- liberal values? How did America get steered so far to the right and how can we move it back to where it should be? Bill Scher of LiberalOasis.com has the answers. He's written nothing less than a do-it-yourself guide to saving American democracy. "Wait! Don't Move to Canada! -- Ten Steps to a Liberal America", released today, is what I believe is the most important book on liberal politics currently in print. With amazing clarity, it details the precise strategy the Democrats need to win back America and save it from years of disastrous Republican policies. Don't let the title fool you -- this a serious and wise book that everyone should read. Remarkably easy to read, Scher's book methodically lays out the values that liberals embrace and that the Democratic Party has been mysteriously running away from for years. It is the perfect companion to "Crashing the Gate," Markos Moultitsas Zuniga's book on the mechanics of transforming top-down Democratic Party politics into a more democratic and broad-based entity infused and enlivened by the grassroots values. Markos purposefully avoids describing in that book is what those values are. 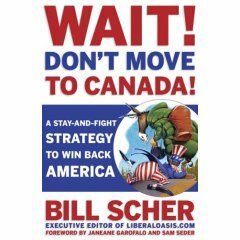 Don't Move to Canada describes those liberal grassroots values and how they can best be articulated. If the Democratic Party adopted the platform Scher outlines in his book, they would have a chance to remake America as a country that embodies the ideals on which it was founded and which we have come to identify as making America great. Do yourself a favor and pick up a copy. It's very reasonably priced ($8!) so you can buy a bunch of copies and give them out on the street. Militarily-Aided Meditation on the Nature of the Self. We'll only torture people some of the time. Subject gets to listen to song of his choosing every three waterboarding sessions. Subject gets a coupon with every false confession. Subject gets to keep his fingernails. In a plastic jar.